In the CNS marketplace, all data refining services are used by giving one or more data items as input and expecting one or more data items as the result. This simple but powerful principle allows using exactly the same technical request-response interfaces for all services regardless of their details. In practice, the marketplace receives and handles data items as compressed zip files without peeking inside. Data items can be very simple, e.g. one image file, or arbitrary complex, e.g. deep directory structure with thousands of files in different formats. Called services are responsible for checking the validity of the input and return and error in case anything is wrong with the data. Service users can learn about required input and expected output by reading the related data/function interface specifications. Data Interfaces specify the detailed structure and semantics of input/output/error data items in the level which is reasonable. Developers can write their own data interface documentation, refer to existing standards, give valid data examples or give an exact schema definition, e.g. as a JSON-schema. Published data interfaces can be browsed and viewed in the CNS marketplace and developers are highly recommended to re-use an existing data interface whenever possible instead of writing a duplicate. Function Interfaces specify the input, output and error data for a valid request to a data refining service and describe high-level service functionality, i.e. how output depends on the given input. 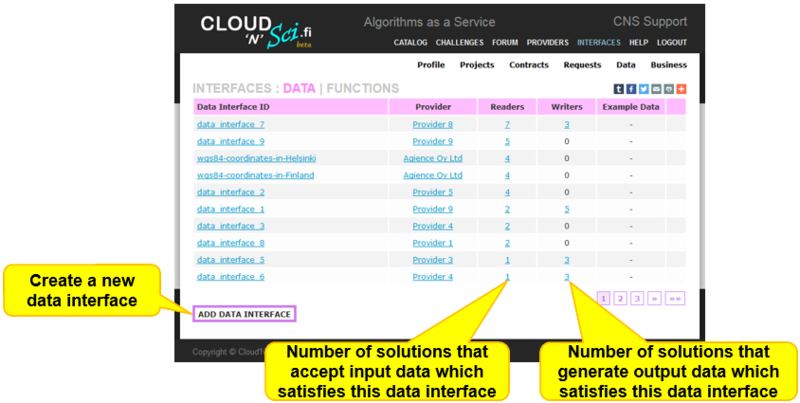 Each data refining service implements exactly one function interface. Each function interface defines 1-N input data items, 1-M output data items and 1-K error data items. Each data item has a unique name (in the scope of the function interface) and refers to one of the data interfaces.